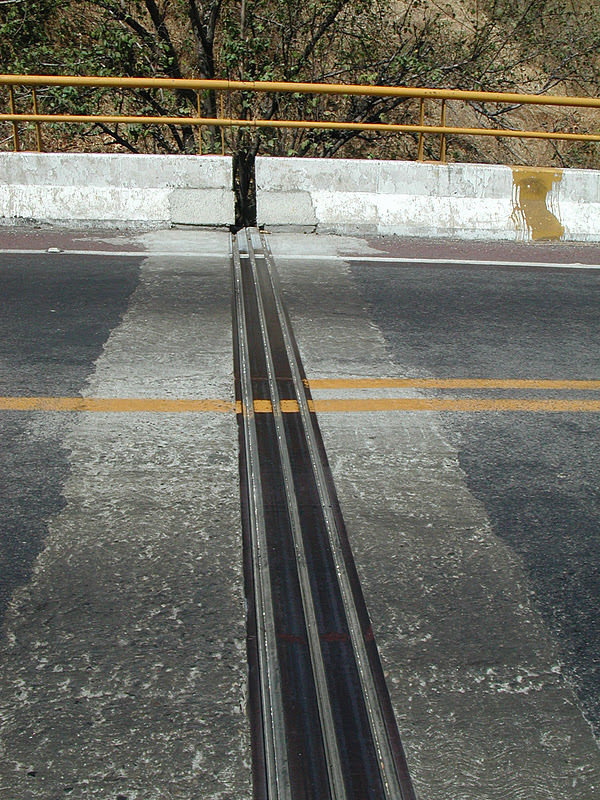 A view of an abutment expansion joint at Puente Pialla, a segmentally constructed, two-span box girder bridge on Route 54D in Jalisco, Mexico. The coefficient of thermal expansion for concrete is 0.000006 units per degree Fahrenheit. This bridge is 158 meters long but it has two expansion joints, so each joint only needs to handle expansion for half the structure. The maximum change in temperature is 100 degrees, so the maximum expansion is 0.05 m or about 2 inches. This expansion joint looks like it can handle more than two inches of movement. It's made of three steel bars with rubber diaphragms that expand and contract as the bridge changes temperature. Note that the steel railing is built to slide in and out of a larger diameter tube as the bridge expands and contracts. The concrete barrier on each side of the expansion joint has been patched. Perhaps the barriers banged together during the 2003 earthquake. That is one of the most common types of earthquake damage. The expansion joint looks to be in pretty good shape. I believe that the road/bridge crew has been doing a good job patching spalled concrete, keeping the expansion joint clean, and maintaining this bridge. Note that the material on each side of the joint is different than the asphalt father away from the joint. Perhaps the deck close to the joint is being kept free of asphalt? We've stopped putting asphalt on our bridge decks and we try to remove it from our decks whenever possible. There are much better materials currently available to protect bridge decks and that provide the deck with a longer life. Mexico's Bridges: Puente Pialla (3) by Mark Yashinsky is licensed under a Creative Commons Attribution-NonCommercial-ShareAlike 3.0 United States License.